The Grand Canyon, an American icon as big as the canyon itself, finds its way onto every southwest road trip. Visitors from around the globe stand on the edge of its majestic landscape letting their eyes wander from the rim to the river. Gazing at the desert-hued layers that resemble a Native American blanket defines the spirit of the West. It’s a bucket list destination for every traveler; a sunset at the Grand Canyon brings people to tears. Read on for help in planning a trip. As one of the most popular national parks, the Grand Canyon offers lots of activities for visitors staying for more than a few hours. 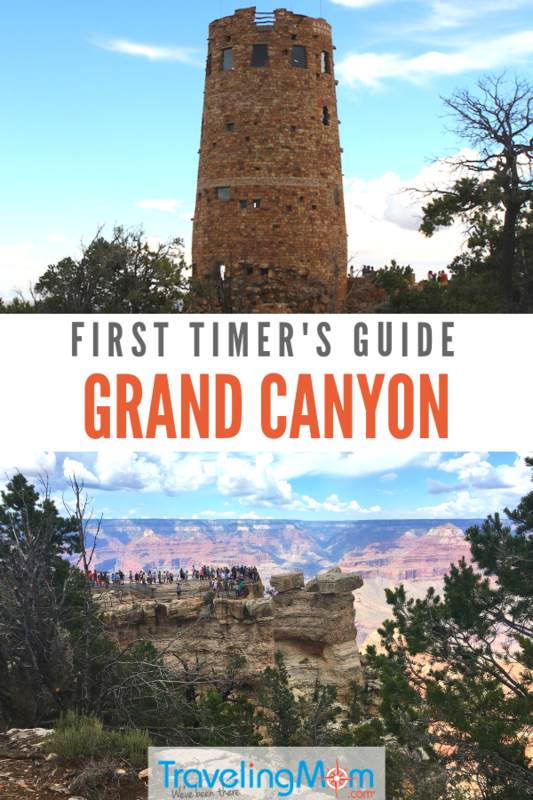 Here are the details of some of the best things to do at the Grand Canyon. The true beauty of the Grand Canyon is it can be enjoyed and explored in a few hours, or for days, in every season. And each time I visit the Grand Canyon I see a new facet, a new viewpoint. My love affair with the top 10 national park never seems to end. During my most recent and sixth trip to the Grand Canyon I explored Desert View, just inside of the eastern entrance of the south rim. As I climbed Mary Colter’s Desert View Tower, her Grand Canyon masterpiece, I scanned the view that Colter wanted to showcase. As I looked through the tiny square windows that dot the exterior, it’s the Colorado River that drew my eyes through the layers of the canyon. It’s a ribbon of vitality with green growth that offers an oasis to the hikers who dare to tackle the canyon trails. 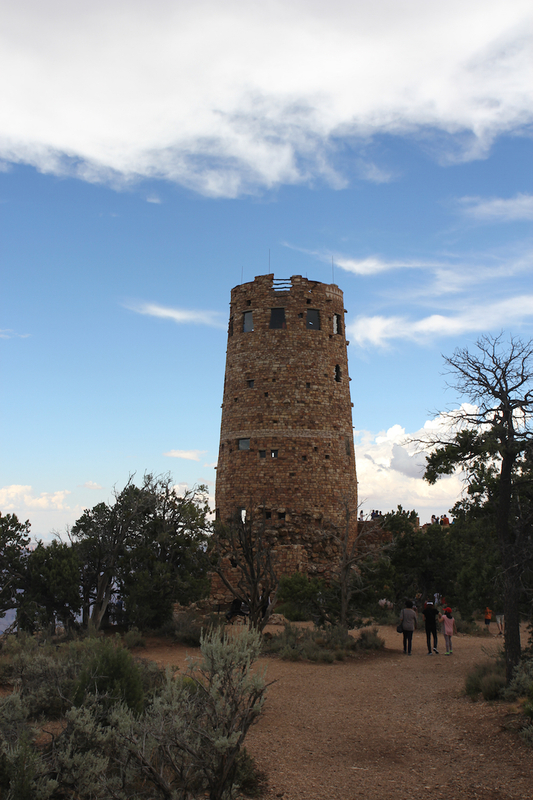 When I emerged from the tower, I took a moment to absorb my surroundings and smell the desert perfume of pinyon pine and sage. If you have just a few hours to explore, start at the Grand Canyon Visitors Center. Then grab the Junior Ranger booklets and watch the introductory movie, Grand Canyon: A Journey of Wander. Outside the Visitor Center, walk to the Rim Trail and Mather Point, both must-dos. If time allows, attend a ranger program or tour the Historic Village. Grand Canyon National Park offers amazing sunsets and sunrises. 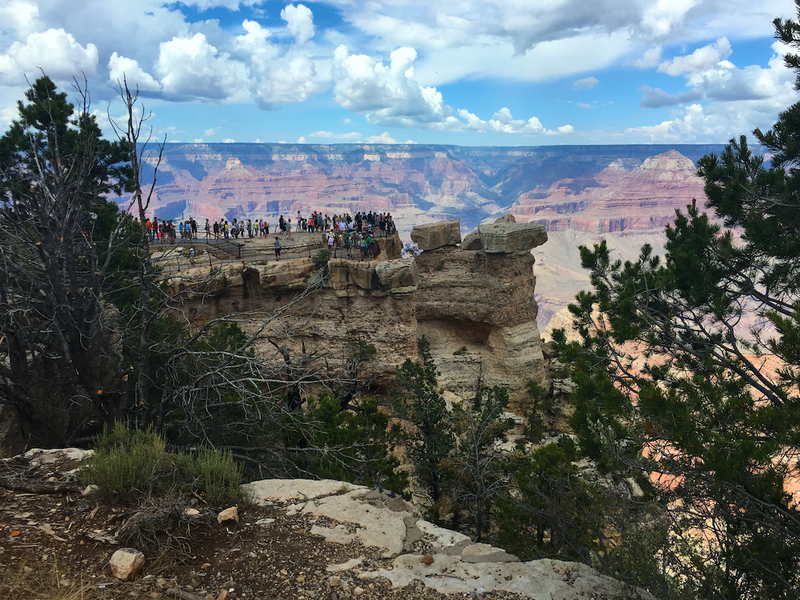 For the best spot to witness this symphony of nature, stop at Yaki or Mather Point. I’ve seen visitors moved to tears at the beauty of this experience. If you have more time at the South Rim, then head to the Grand Canyon Historic Village, a registered historic district designed by Mary Coulter, the original architect. At the Village I recommend taking the self-guided walking tour. First start at the Santa Fe Train Depot, a log building, to see how visitors arrived at here 100 years ago. And it’s still in use today; the Grand Canyon Railway offers a historic train ride from Williams, Arizona. Second, walk up the stairs from the railroad depot to El Tovar Hotel and see the rustic elegance of the historic landmark. Walk through its common areas. This walk will take you along the Grand Canyon Rim Trail. Then head to Hopi House, a souvenir shop, and the Bright Angel Lodge. Walk through the Bright Angel common rooms, and find the geologic fireplace. It displays the rock layers of the canyon. This is also a good place for a meal or snack. And stop by the Buckey O’Neill Cabin. Continue along the Rim Trail to the Lookout Studio and Kolb Studio for their unique vantage points of the Grand Canyon. After exploring along the Grand Canyon Rim Trail and the Historic Village, head to either the Desert Watch Area or the Hermits Rest area. Both are accessible using the Grand Canyon shuttles. Mary Colter’s Desert Watch Tower stands erect at the eastern entrance of Grand Canyon National Park. Here you can see the Colorado River at the bottom. Just climb the spiraling staircases of the Desert Watch Tower and look out one of the tiny square windows. She framed out a view like a painting. Or head out to the Hermits Rest. During the canyon’s high season (March to October) this road is closed to private vehicles. With 7 miles of rim trails and nine rim stops along the free shuttle route, it offers different viewpoints. 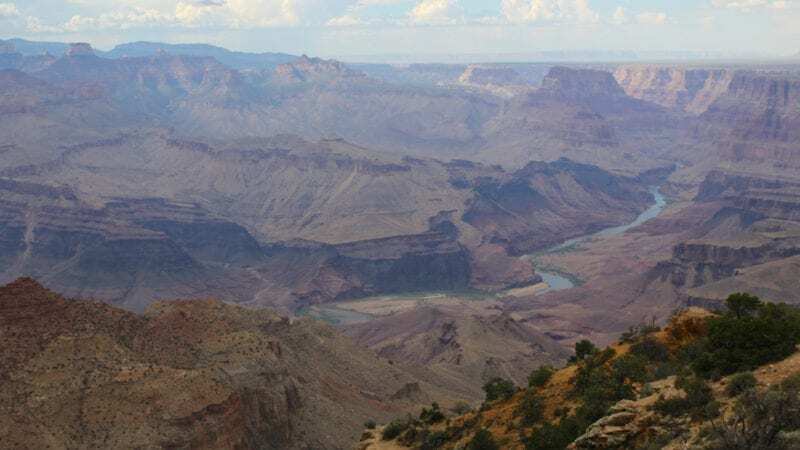 Kids want to tour the Grand Canyon on a bike instead of hiking? Find bikes for rent next to the Visitor Center. All bike sizes and helmets are available. And the South Rim of the Grand Canyon offers some multi-use trails, suitable for bikes. The Hermits Rest area offers 3 miles of the Greenway Trail, a multi-use trail. Head to the visitor centers for more information. A mule trip to the bottom of Grand Canyon tops many a bucket list. Though the trip to Phantom Ranch is the most famous, it’s not the only option. Lodging and meals are available at the Phantom Ranch. One and two-night (winter only) mule trips are available. Reservations are required for Phantom Ranch mule trips. For the families who need shorter rides, the canyon vista is a 4-mile ride along the rim. The North Rim also offers mule trips into the canyon and along the rim. Age and weight and height restrictions for mule rides. For families looking for river raft trips, both smooth and white-water raft trips are available through several companies. As a partner of the Grand Canyon National Park, the Grand Canyon Conservancy Field Institute offers guided tours and classes for visitors. Guided tours and day trips are lead by experienced and knowledgeable guides. And find tours ranging from hiking, backpacking and rafting with multi-day camping trips available for individuals and families. Learn a new skill at the Grand Canyon. The Grand Canyon Conservancy Field Institute offers courses in photography, writing, painting, jewelry-making along with yoga retreats. And check in at the visitor centers for current art exhibits and demonstrations. Guided bus tours of the South Rim offer another option for discovering the Grand Canyon. Several different tours are available, including sunset tours. The tours use motor coaches. For a unique tour, consider a helicopter tour of Grand Canyon. Departing daily from Tusuyan, get a bird’s eye view of the canyon. The Junior Ranger Program is the go-to program for families to learn more about national parks. It’s free and takes about two hours to complete. My kids collect the patches and badges that they’ve earned during our national park adventures. The Grand Canyon Junior Ranger program has a booklet specifically designed for each age group. To earn the Junior Ranger badge, families are required to attend a Ranger Program. Find a program list at the visitor centers. For night owls, the Grand Canyon offers the Night Explorer Junior Ranger Patch for kids who attend a special Night Skies Ranger Program. Booklets are available at visitor centers. If you’re headed to the North Rim, then kids can earn a special North Rim Junior Ranger badge. If a trip to the bottom of the canyon is on your itinerary, there’s a special Junior Ranger Program. Phantom Rattler Junior Ranger patch is awarded at Phantom Ranch, a 10-mile journey, one-way. For babies and toddlers in strollers, the Rim Trail is a paved sidewalk. Though watch small children the rim trail doesn’t offer a fence on every section. Consider a baby carrier for lengthy hikes. The South Rim offers several options for dining. Head to the Village Market for basic groceries; it offers an attached deli. Find restaurants at El Tovar Hotel open for breakfast, lunch and dinner, though it requires a dinner reservation. Also find a tavern in the El Tovar. The Bright Angel Lodge features a restaurant open breakfast, lunch and dinner. Also find the Arizona Steakhouse. Then the Bright Angel Lodge provides a bar and coffee shop. 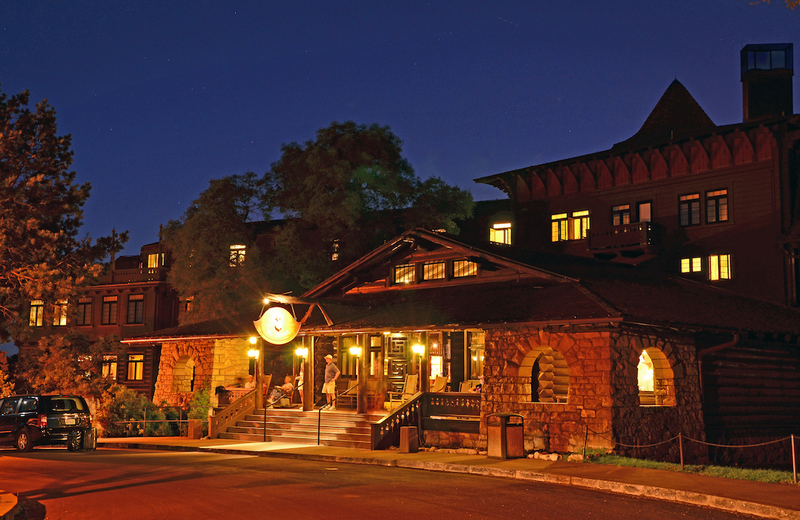 Yavapai Lodge offers a restaurant, coffee shop and tavern. Desert View features a general store and deli. The Maswik Lodge offers a food court and pizza place. And find a snack bar at Hermits Rest. The South Rim of the Grand Canyon features more than 900 rooms or cabins. I found several options ranging from historic suites to family-pleasing cabins to modern hotel rooms. El Tovar Hotel, built in 1905, is the premier property on the South Rim and built of local limestone and Oregon timber. Take a peek and walk through the lobby if you’re not a guest. Bright Angel Lodge and Cabins, built in 1935, offers a more budget-friendly option and my choice for families. It features locally sourced materials and colorful Southwestern motifs. 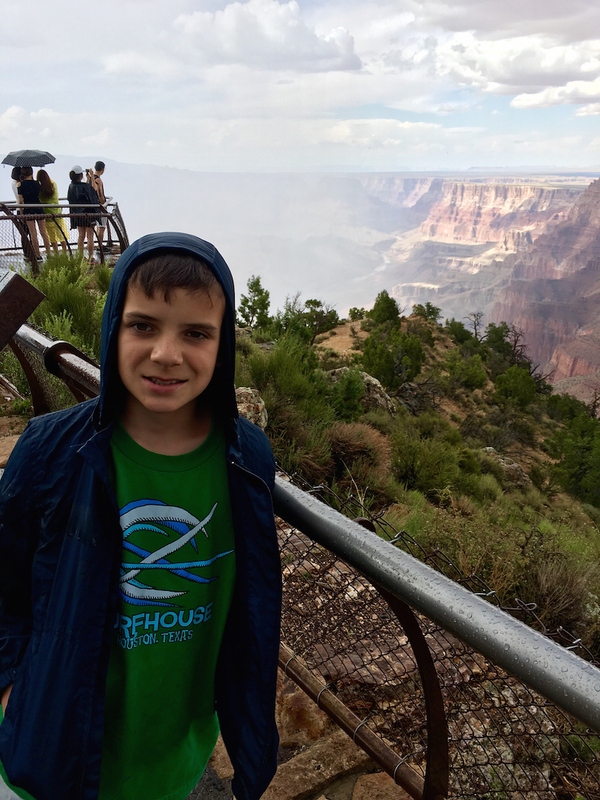 My kids loved staying along the Rim Trail and the historic rooms offer amenities modern travelers need like in-room coffee. The Phantom Ranch, built in 1922, requires a 10-mile hike to the bottom of the Grand Canyon or a ride on the famous mule train. It takes reservations 13 months in advance for this bucket list destination. The Kachina Lodge and the Thunderbird Lodge were both built in the 1960s along the Rim Trail with modern travelers in mind. The Maswik Lodge and the Yavapai Lodge were built at the same time, though aren’t on the Rim Trail. If spending the night, park your car near your lodge and use the complimentary shuttle bus. Since the majority of the lodging is located near the Grand Canyon Historic Village, the Verkamp’s Visitor Center is closest. Off on the horizon is the other side of Grand Canyon National Park. The North Rim of the Grand Canyon offers a different perspective. Less crowded and greener, the North Rim is a seasonal entrance. With elevations over 8,000 feet, it closes for snow. And snow arrives early on the North Rim so the Grand Canyon Lodge is open from May 15 until October 15. At the Grand Canyon Lodge, find western and pioneer cabins along with motel rooms. Inside the Grand Canyon Lodge head to the main dining room for views of the canyon. Or stop at the deli, the buffet, the saloon or the coffee shop for dining on the North Rim. For other traveler’s services find a general store, laundry, showers, campgrounds and a service station at the North Rim. The South Rim of the Grand Canyon offers accessible walks with wide and level concrete sidewalks. The Rim Trail offers a .5-mile section with spectacular views of the rim. The Trail of Time offers a longer option with a 1.3-mile sidewalk. For in-depth information, consult Candy B. Harrington’s barrier-free guidebooks for National Parks, including one for the Grand Canyon. 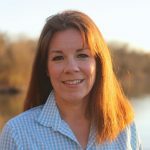 She offers accessibility information on lodges, trails and viewpoints as well as lodging inside and outside of the park. The Colorado River carved the Grand Canyon, measuring 18 miles wide and one-mile deep and 277 river miles long. Human artifacts have been discovered in the Grand Canyon that date back 12,000 years. First protected as a forest reserve in 1893 then as a national monument in 1908, the Grand Canyon earned national park status in 1919. The United Nations declared it an UNESCO World Heritage Site in 1979. The Fred Harvey Company, a NPS concessionaire, defined the look of Grand Canyon National Park when it built the El Tovar Hotel, the Bright Angel Lodge, the Phantom Ranch, the Hopi House, Hermits Rest and Desert View Watchtower. Mary Colter, the lead architect of the Fred Harvey Co., designed the buildings to seamlessly blend into the environment by using local materials. In the Bright Angel Lodge, she designed a Geologic Fireplace that displays the layers of Grand Canyon’s rock as found on the canyon wall. Her buildings are registered National Historic Landmarks and the majority are located in the Historic Village. It’s in northern Arizona, about 280 miles from Las Vegas. Find two nearby towns with restaurants and lodging, Williams and Tusayan. Grand Canyon National Park offers two entrances for the South Rim, the South Entrance (Tusayan) and the Desert View Entrance. The South Entrance, 59 miles north of Williams via Highway 64, is the most popular gateway and enters the park just minutes from the main Grand Canyon Visitor Center. The Desert View entrance provides a less-crowded alternative for the South Entrance and offers a scenic drive along the rim from Desert View Watchtower to the Grand Canyon Village. At Flagstaff, head north on U.S. Route 89 to Highway 64, just south of Cameron, Arizona, another town for a quick fill-up. Williams, Arizona, (WMA) is an Amtrak destination and a stop for a regional bus service. The closest airport with commercial flights is Flagstaff, Arizona (FLG), 80 miles away. Several private tour operators offer tours of Grand Canyon, like Viator, that depart from Las Vegas. Grand Canyon National Park is open 365-days a year and 24-hours a day. Use an America the Beautiful annual pass ($80) or purchase a 7-day pass for $35 per private vehicle. The Grand Canyon Visitors Center offers the most parking with four large lots and shuttle buses. For day visitors, park at the Visitor Center and use the shuttle bus. And remember to grab your daypack and refillable water bottles. The shuttle buses offer color-coded routes and a route that continues into Tusayan, right outside the park. Please check the Grand Canyon National Park website for all current routes and times. Tusayan, right outside the South Entrance, offers food, gas and lodging. Williams, Arizona, on Interstate 40, offers more services for travelers. The South Entrance can have a line to enter during daylight hours. Got rowdy kids that make you nervous near the unfenced edge? 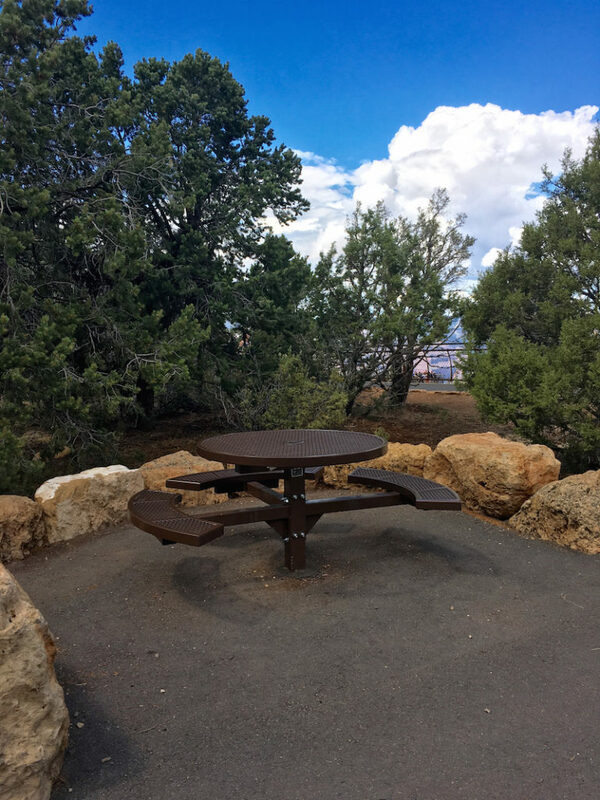 Stay close to Mather Point; it offers 4-foot fence for your peace-of-mind. Pack a daypack with a water bottle, a hat, protein bars or other snacks and sunscreen. I use a cinch sack for my younger kids so they can carry their own stuff. Hiking to the bottom of the Phantom Ranch via the Bright Angel Trailor South Kaibab Trail requires a backcountry permit and two days. IT’S NOT A DAY HIKE. Inspiring to meet a family able to go and go again, and again! to the Grand Canyon. We might not spend the night every time but Grand Canyon is very convenient as a road trip stop along the Interstate 40. The weather is fairly good year round too.